If you wait any longer to plan your trip to Ladakh, you will face something more dizzying than the heights – the thousands that flock to the moonscape mountains! A once isolated desert kingdom, Ladakh now invokes much intrigue amongst musafirs and is a haven for bikers, cyclists, and travellers craving its unique sights. Come June and the passes open up to a stream of ‘mountains deprived’ travellers who keep coming until September. So hurry before the crowds get there! To visit the iconic places of Ladakh, you’ll need at least 9 days. Start from Manali and reach Leh over two days, including a night in Keylong or Sarchu. This helps you acclimatise by Leh. 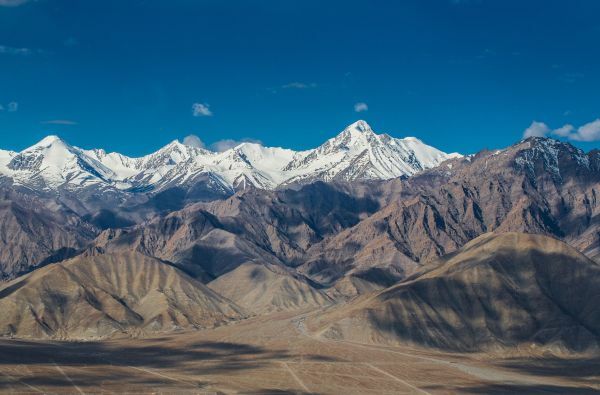 Using Leh as your base, plan a day trip to Pangong Tso and an overnight visit to the Nubra Valley. Keep a couple of days to visit monasteries like Hemis, Shey, and Thiskey (all near Leh) and for the city markets too. You could choose to fly out of Leh or take the overnight road trip, via Kargil and Draas, to Srinagar and fly out from there. In Ladakh, you have to switch cars depending on the region, but don’t worry – they are uniformly priced and easily available. If you are flying back from Leh, book NOW before airfares go sky high! So get started right away, as hotels, flights and cabs get expensive closer to the season. Experience a local festival as it will give you an intimate glimpse into Ladakhi culture. The annual Hemis festival falls on June 18th -19th this year and is a must-see, especially as the monastery is a short ride (40km) from Leh. Expect a riot of colour at the 300-year-old monastery with masked dances, musical performances, local food and a bustling market at the fringes. Don’t miss out on Pangong Tso, the lake that changes hues with every view. Drive through Khardung La, one of the highest passes in the world, on your way to Hundar, where you can ride the double humped Bactrian camel. Planning your sightseeing in Leh would also help take in unique experiences like the Leh Heritage Walk, watching Thangka artists at work, and would also give you time to plan which monasteries to climb to. Pack in whatever can keep you warm – it can drop to 5° or lower in places like Pangong Tso and Sarchu. While the days can be as warm as 30°, the evenings are cold enough for woollens. Do not forget gloves and caps and dress in layers, covered by a wind resistant jacket. UV sunglasses and sunscreen over 30SPF should also find place in your luggage, along with spare batteries and extra memory cards for cameras. You will be surprised at your own enthusiasm for photography – Ladakh does that to everyone! All Indian travellers must obtain an Inner Line Permit, issued by the DC office in Leh, to travel within Ladakh. International citizens need a Protected Area Permit. You could ask your hotel or car rental company to organise this before you arrive. Altitude over 10,000 feet with low oxygen levels are demanding on the unfit and Ladakh needs a fair amount of walking to climb up to monasteries or even your favourite restaurant. Hit the gym now and enjoy Ladakh in a fitter avatar. Last, but not least, make sure you visit photography websites to take some tips on clicking the stunning terrain of this unique land. After all, the surreal beauty of Ladakh demands proof for when you can’t believe you actually made it!